Keratin Research's Original Formula straightens and smooths your hair for 4-6 months. No Need to wait 3 days- Express formula. Includes: 300ml Original Formula Keratin, 300ml Clarifying Shampoo, 300ml Sulfate Free Shampoo, 300ml Sulfate Free Conditioner, Easy Comb. Among all the hair treatments on the market today, few are as raved about as Keratin. This protein makes crinkly hair straighter, frizzy hair smoother, and dull hair shinier. Its benefits are long-lasting too. The problem is the price. Going to a salon for this treatment can cost you from $300 – $800 each trip. So why not go with the option to do it yourself at home for over half the cost? Before you start shopping around, it’s important to know which products will give you the salon-quality results you’re looking for. We put together a list of trustworthy keratin treatments to consider. This Keratin Research Brazilian Keratin Blowout Hair Treatment is your golden ticket to gorgeous, straight locks. It’s a complete set of Brazilian blowout essentials that are easy to use, and according to customers, a tried-and-true remedy that delivers on its promise to give you that vibrant, smooth hair you’ve been wishing for. The set includes a keratin treatment, a clarifying shampoo, a sulfate-free shampoo, and a smoothing conditioner. The shampoos and conditioners are designed to be a companion to the keratin treatment and help the results last even longer. What makes this keratin treatment so wonderful is its gentle ingredients and breakthrough patented formula called Inverto. This 10 oz bottle of keratin treatment is packed with Moroccan Argan Oil, which has been proven to provide exceptional benefits for even the frizziest of hair. The main benefits come from its rich vitamin E content. Vitamin E serves as an antioxidant and a moisturizer for both hair and skin. The best part about this treatment is the fast results. Many at-home treatments require you wait up to 5 days to wash out, while Keratin Research Brazilian Keratin Blowout Hair Treatment allows to wash out the next day! Along with Argan Oil, the treatment contains coconut oil and other proteins to make hair shinier and stronger. It’s also super easy to use. Just be sure to follow the recommended steps included. You start by washing your hair thoroughly with the clarifying shampoo. This will allow the hair follicles to loosen so the keratin can work its magic as effectively as possible. It will also help to rinse all impurities away in preparation for blow-drying and styling the hair. After washing with the clarifying shampoo (do not use conditioner afterwards) and blow-drying the hair, you’ll be ready for the keratin. It’s recommended that you wash with the clarifying shampoo 2-3 times for the best performance. To apply the keratin, you’ll need to make sure your hair is completely dried and brushed. The clarifying shampoo may make it difficult to comb. However, that is a sign that the shampoo did as it was supposed to. After dividing into three sections, the keratin will need go on every single strand of hair. It is very important that the entire head of hair is covered in keratin solution. A comb will be perfect for spreading the treatment evenly. Though you need to cover your hair completely, you also don’t want it to be completely drenched. Excess keratin can be combed out easily. The treatment will need to stay in for at least 20 minutes. After those 20 minutes, you will blow-dry the hair on medium heat, then straighten using a flat iron. This may be one of the most important steps in making that hair gorgeously shiny and calm. Straightening the hair will seal the keratin into the cuticles. You will most likely need to run the flat iron 7 – 12 times over each group of hair. Of course use common sense and don’t overheat it. This could cause your hair to burn and frizz. After at least 24 hours, you can wash your hair using the sulfate-free shampoo and the soothing conditioner. Customers mention how wonderful their hair feels after the first wash with these products. From here, your hair will be straighter and easier to maintain. You will be able to dramatically decrease the amount of time it takes to style your hair for the day. This is one of the biggest reasons to try out this product. As already mentioned, it’s also very easy to use and follow the instructions. To this date the product has a 4.3-star rating on Amazon with several happy customer reviews. A large number of reviewers were thrilled to find a salon-quality solution at such a low price, especially those who would normally spend hundreds at a salon. One thing to note about this product is you’ll definitely want to perform the keratin step in a well-ventilated area. The product is so powerful that the scent could burn the eyes if you don’t have enough airflow. As mentioned earlier, be sure to follow all steps extra carefully to ensure you reap each and every amazing benefit of this treatment. Though it didn’t make it to number one, this product is our next choice for an amazing keratin treatment. There are several before-and-after photos from customers to prove it. It is made and sold by Moroccan Keratin, a haircare company that provides a wide range of keratin and Brazilian Blowout products. The Brazilian Keratin Hair Treatment Set is their most popular. They ship this kit worldwide, and it comes with the keratin solution, pre-treatment shampoo, and post-treatment shampoo and conditioner. All four items in the kit come in 4 ounce bottles. Like Keratin Research’s treatment, Moroccan Keratin Hair Treatment is a simple four-step treatment that is very effective in straightening and smoothing out frizzy hair. The main difference between the two products is the length you’ll need to wait before washing out the keratin product. Users are advised to keep hair dry for 3 days before washing it out. Don’t let that stop you though. It holds a 4.3-star rating on Amazon, and customers are glad they tried it. The first item in the kit is a deep cleansing shampoo that is meant to be used prior to the keratin solution. Second, the keratin hair treatment itself. It contains keratin, Moroccan oil, and essential amino acids to strengthen the hair during treatment. 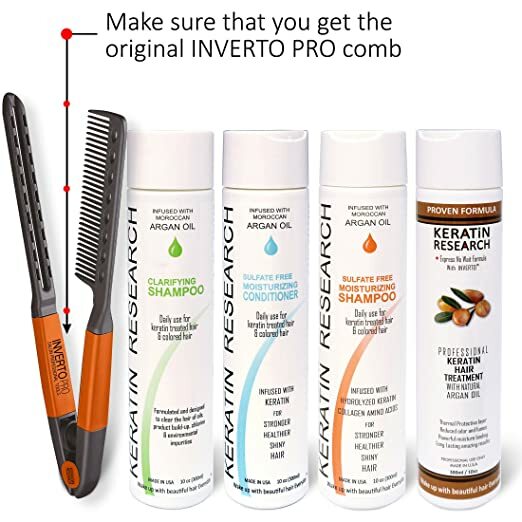 The third item included is a post-keratin shampoo that is specifically formulated to protect treated hair. It also helps to protect colored hair. The fourth bottle is a sulfate-free conditioner that, like the post-treatment shampoo, is designed to protect hair after the keratin and give it a boost in shine. The main ingredient, along with keratin, is Moroccan Argan oil. This is a popular ingredient in so many hair products out there. This oil is known for its ability to add softness and shine to any hair. It also protects the hair from heat damage that can sometimes occur with straighteners, curling irons, and blow dryers. It’s important to use a product that has a good amount of Argan oil because of the high temperature that keratin treatments require. Something to keep in mind is that some customers have reported not receiving instructions on how to use the kit. However, you can find quite a few videos on YouTube that can help out if this is the case for you. All the steps will be just like with most keratin treatments. As long as you follow directions carefully, you will be able to give your hair long-lasting results quickly. You also want to be sure to use only sulfate-free products after going through the treatment. Failure to do this could mean dried out hair, and you’ll need to wait a few weeks to try the keratin treatment again. 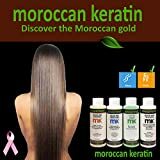 Overall, Moroccan Keratin Hair Treatment is worth a try! Plus, the price is less than you would pay for more high-end brands on the market. It is a great system that will begin transforming hair instantly. No matter how coarse or wavy your hair may be, you can give yourself straight and shiny hair that will continue to stay that way for months. This is a good option for those who want to try a keratin treatment for the first time, but don’t want to spend as much money. Our Bronze pick is a little different than our Gold and Silver winners. 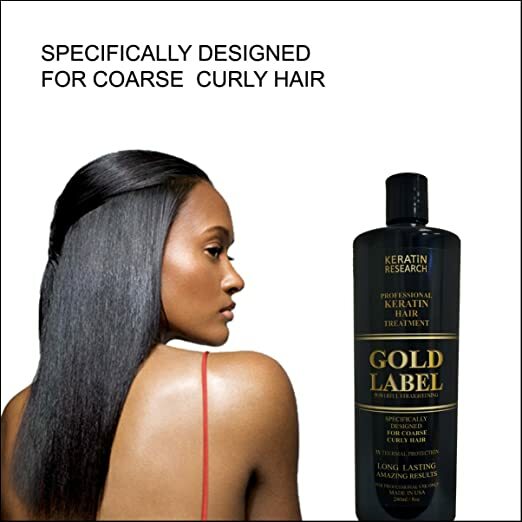 Keratin Research Gold Label Professional Keratin Treatment is specifically designed for overly coarse and unmanageable hair types. Though it doesn’t come with pre-wash and post-wash shampoos, the keratin treatment comes in a larger 8-ounce bottle. This is great if you want a treatment that you can use multiple times before needing to replace it. This makes it an excellent value! Based on customer reviews and ratings, it works very well and provides excellent results. Typically, women with African, Dominican, and Brazilian backgrounds have naturally thick and wavy hair. Though gorgeous, it can be difficult and time-consuming to style and maintain. If this sounds like you at all, it may be a good option to purchase a treatment created with your specific hair type in mind. The formula is stronger than most keratin treatments. It also contains a wide variety of oils to moisturize and strengthen. The Keratin Research Gold Label Professional Keratin Treatment contains argan, grape, avocado, and jojoba seed oils for maximum moisture and thermal protection. Because this treatment does not come with a pre-wash shampoo, you will want to make sure you use a shampoo that is sulfate-free. This preps the hair for the hot keratin process it will go through in the flat-ironing step. One recommended accessory you may want to grab along with this keratin treatment is a hair salon cape. With such a potent product, you may endanger your clothing while performing the treatment. Customers also commonly recommend a pair of glasses or goggles. The fumes will be very strong and could cause the eyes to become very irritated. The waiting period for the Gold Label treatment is three days. It will help to keep hair straightened for months, which can help save time getting ready every morning. It will also help to smooth split ends that are caused by needing to use a flat iron so often to style the hair. Along with these benefits, hair will look incredibly shiny and frizz can be eliminated. This solution will require the same simple steps as the other treatments on our list. After treatment, you can use your favorite clarifying moisturizing shampoo and conditioner. Another benefit of this product is the amount of treatments you can give yourself with just one bottle. In four step kits, the bottles typically come in small bottles. With this product, you get double the amount of product. That means double the amount of treatments. This will save you even more money in the long run. With thicker, fuller hair, you most likely need to use more product. So the 8 oz bottle is the best way to go. 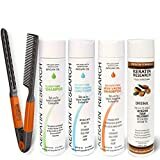 This keratin treatment has a good amount of positive reviews on Amazon. 89% of the reviews are 4 and 5-star reviews. 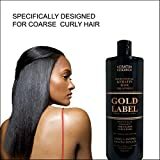 What users mention the most is that Keratin Research’s Gold Label formula worth the investment, and that it will smooth out even the most unruly hair. So if you believe you may need a stronger keratin treatment, it’s recommended that you give this product a try. 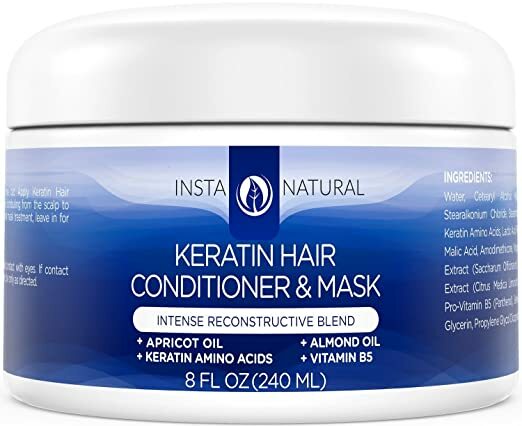 If you’d prefer to try out a cheaper keratin treatment, InstaNatural Keratin Mask Treatment is something you’ll want to check out. This hair mask is a much milder option. It’s more like a conditioner that provides longer-lasting shine and moisture. It also has a very light and floral scent, which is a nice difference compared to the stronger keratin treatments. It’s also full of natural and organic ingredients and oils. It will treat your hair nicely and provide it will strength and shine. This product is not exactly a full keratin treatment, but yet way more than just a regular conditioner. Ingredients include vitamin B5, green tea extract, mango butter, aloe, and coconut oil. Along with coconut, there is argan oil, jojoba oil, apricot oil, and almond oil. With all those natural oils and ingredients, hair will become healthier and stronger. These oils are responsible for the gorgeous shine this product will provide. However, because of these oils, you may find that hair will become greasier faster than normal after treatment. InstaNatural Keratin Mask Treatment comes as a single product. You won’t receive a kit with conditioner and shampoos for recovery and preparation. But remember to use a sulfate-free shampoo prior to the keratin treatment. This will ensure your hair is clear and ready for the keratin. It comes in an 8-oz bottle as well. Depending on the length of your hair, you can get about 8-12 treatments from just one jar. Like the other picks, it’s easy to use. It is a slightly different process though. After rinsing hair with your choice of sulfate-free shampoo, you will need to gently dry hair with a towel. Unlike other treatments, this product needs to go onto damp hair. After the product has sat on hair for at least 20 minutes, hair can be rinsed thoroughly and then blow-dried. There is no need to wait one to three days for this mask. The best part is, you’ll see the results as soon as you step out from rinsing out the keratin. It can work on any hair as well. It’s a great sign that it has over 1,300 positive reviews on Amazon. Though it won’t give you the same powerful results as a full at-home keratin treatment, it’s perfect for those who don’t have time to spend on it. According to customers, it is an amazing product at an amazingly low price. Most people saw an instant change in glossiness and softness. People love this treatment. It works on all hair types as well. Sounds as though anyone could have a really good chance of loving it too. When it comes to keratin treatments, the most important thing to look for is something that will not harm your hair. Though most treatments are safe and easy to use, there are some products out there that don’t claim they are what they say they are. This means that the product could fit your budget, but filled with very cheap chemicals that will do more damage than good. Check out the ingredients, read reviews, and do a little research about the product company to make sure they have a good reputation for quality. Because keratin is so powerful, you just need to make sure you do a little more research than you would before buying other hair products. However, you can definitely find good quality and highly effective keratin treatment options for a great price. No matter what keratin treatment you purchase, you will need to expect a strong-smelling product. Most salons that provide Brazilian keratin blowouts will have high-powered exhaust fans throughout the building, because of the powerful keratin solution that’s used. With this is mind, you need to decide if the strong smell is something you can handle. You’ll need to have access to windows and/or fans for ventilation when using the treatment. If you don’t want to deal with such strong chemicals, you can look for milder keratin solutions. Look for a treatment that doesn’t contain formaldehyde. The treatment won’t be nearly as effective without it, but you won’t risk having to breathe in something you’re sensitive to. Depending on how strong of a treatment you want, you’ll need to have both the time and patience to follow the product’s instructions completely. Failure to do so could result in damage to the hair, and disappointment in the results. Don’t let that scare you at all. Just be aware of how much time and effort you are willing to put into treatment, and purchase one accordingly. For example, a stronger treatment will most likely advertise that it is made for very thick and coarse hair. In this case, you can bet that the treatment will take a little longer and your attention to detail will need to be outstanding. If you’re looking for something a little easier and faster, there are several milder options to choose from. Either way, be prepared to follow instructions thoroughly so that you can achieve all the amazing rewards of keratin. • Hair Dryer – Be sure your hair dryer is slightly powerful. You will need to be able to dry hair completely before applying any keratin, and to save on time, it helps to have a decent dryer. • Hair Straightener – It’s recommended that your flat iron have a high of 430 degrees. You need the straightener in order to seal in the keratin, but it needs to be very hot. • Comb– Without a comb, it will be very difficult to divide the hair for applying the best keratin treatment. The comb is also used to evenly disperse keratin and to brush out excess keratin. • Hair Clips – Though not essential, large hair clips will be very helpful for separating hair into large sections before applying the keratin. Separating the hair into sections is a common step for treatments like this, as it helps to keep track of which areas you have covered. • Heat Resistant Gloves – These are optional, but highly recommended. You may want to have one or two heat resistant gloves on hand before your treatment. The flat iron temperatures can burn skin very easily. It is completely unnecessary to spend hundreds on one keratin treatment at the salon. You just need to try it at home, and get more for your money. You certainly do not need to be a professional to do these yourself either. Quality in-home treatments can be found at remarkable prices, and provide you with straighter, more manageable locks. This way you can pamper yourself without even needing to leave the house, and the results will last months. Everyone does and should have access to keratin and the incredible benefits it provides.